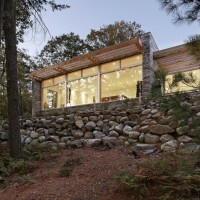 Tact Architecture have designed the Carling Residence in the Muskoka region of Ontario, Canada. 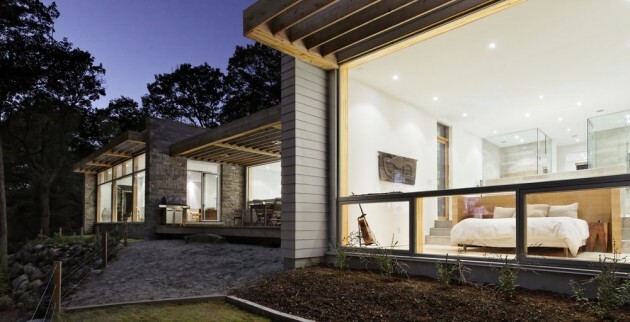 Located in Canada’s beautiful Muskoka region, the Carling Residence was built for a young couple looking to leave the city behind. 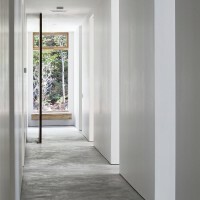 The 3600 square foot home is set into a rustic forest on the shores of the Georgian Bay. The clients’ aspiration for their new permanent residence was to create a comfortable, modern and sustainable home that would respect, and become part of, the terrain of their 26-acre lot. 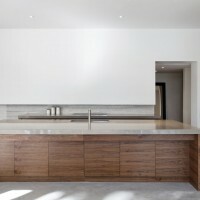 Entrusted with the clients’ vision TACT Architecture crafted a calm and elegant design. Particular care was taken to site the home to optimize the landscape’s natural features while preserving the natural topography. 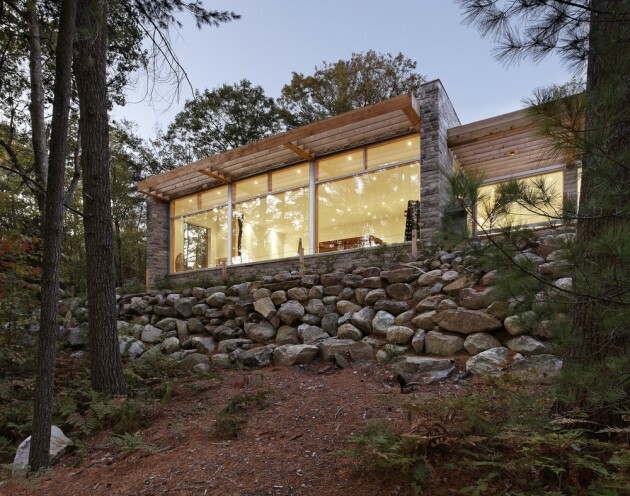 The house nestles itself into a clearing between two ridges of rock to the east and west. 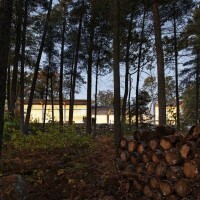 Set amongst the towering trees the house benefits from their natural shade and privacy while still allowing for spectacular views of the forest and Georgian Bay. Approaching the house from the north you are presented with a resolutely understated façade with minimal glazing. Once inside the home you are struck by spectacular views from large picture windows that make up most of the southern building face. The minimalist inspired interiors compliment the rugged surroundings enhancing the beauty of the landscape and making it an integral part of the design. The simple restrained material pallet of stone, wood, concrete, and white walls contribute to the elemental feeling of the house. Ultimately the design demands little of the site and its resources. The residence sits in the midst of the treed lot, with minimal east-west glazing, and large trellised overhangs above south facing windows. This optimizes views and day lighting, while minimizing solar gain. To ensure a comfortable interior climate the building envelope features insulated concrete form walls and a spray-foam insulated roof. The home is heated by a zoned radiant floor system via a high efficiency boiler supplemented by a heat recovery ventilation system. While the concrete floor slab is the source of heat, it also serves as a heat sink in the winter months and helps keep the home cool during the summer. The house does not have, nor does it require, an air conditioning unit for cooling. Both the north and portions of the south windows are operable permitting natural cross ventilation, further contributing to the comfort and natural feeling of the home. The disciplined use of materials, balance of environmental and design impacts, and optimization of the client’s prescribed budget, were all considered as carefully as the spatial qualities of the home. Though the house is a new insertion into a pristine landscape, the design allows it to reside as though it has always been a part of the land.